How Well Do You Know Your Organization’s IT? How current is your technology environment? Have you identified known risks and addressed how they are impacting your business? Effectively managing your technology can be overwhelming and confusing. And it’s not always easy to stay on top of the dynamic IT landscape, especially as your organization grows. It’s okay if your IT isn’t your best friend for life and you don’t know everything about it. That’s why we developed the Marco Technology Assessment. We want to help you mitigate risk, align with industry best practices, meet compliance standards, solve security issues and ultimately optimize your technology. 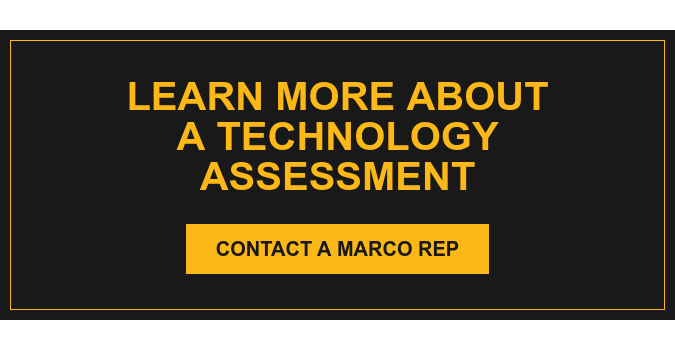 Marco’s Technology Assessment starts with a baseline understanding of your organization’s technology. An IT technician installs a device detector on-site to gather data and check your current environment. After reviewing the data reports, a Marco certified systems engineer provides a consultative assessment of your environment. We cover everything from A to Z. The assessment process includes analyzing your current state of technology and identifying known risks and the associated business impacts. After the initial assessment, your certified systems consultant will share the findings and outline any concerns that may affect your business. We will offer recommendations to better manage your technology environment so you can avoid pitfalls, stay up-to-date and prepare for growth. Your IT management is a significant part of your success. We want to be part of your progress. Let Marco help you take your technology further.